Luvo has been part of the mission since he was five years old. His mother and father were founding leaders in the church. It seems like he is part of the church family all his life.At a very early age, he displayed unusual musical giftings. After he graduated high school, the mission sponsored him to study music at the university, where he earned a diploma in Music. He later studied to become a middle-school teacher. 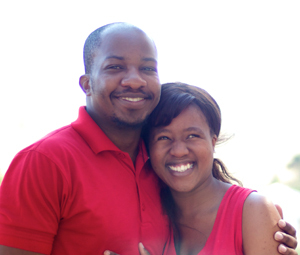 While studying music, Luvo met Sanele, whom he married in 2011. Sanele comes from the neighboring location of Idutiwa. As Sanele also studied music at the university, it became evident to her instructors, that she was a gifted opera singer. This gifting was developed while studying music at the university. Luvo serves the ministries as the Mission Manager, while Sanele exercises her hospitality gifting as the Mission Hostess and assists Luvo in managing the mission.Luvo enjoys rugby and teams sports, while Sanele enjoys singing and eating chocolate. They both are very gifted in worship and praise.